‘Queen Anne legs’ is a term used to describe a certain form of deformity of the forelimbs between the elbows and wrists (an area of the body termed the antebrachium) in which the legs below the elbows are turned inwards and the paws are turned outwards. The term refers to furniture that was popular in the time of Queen Anne (not that Queen Anne had particularly abnormally-shaped legs). 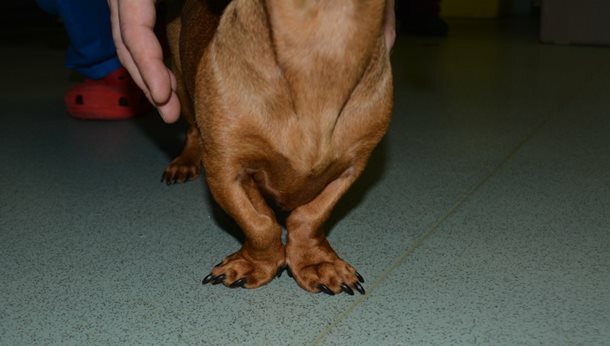 The deformity is part of ‘normal’ anatomy for terriers and dachshunds, but when severe it can become a problem, resulting in elbow osteoarthritis (because the elbow fits poorly) and wrist osteoarthritis (because the wrist is loaded abnormally) in addition to what is termed ‘buckling’ where the wrist collapses forwards during loading because it is twisted so far around. Above: Queen Anne legs demonstrated by a two year old dachshund presenting with forelimb lameness. 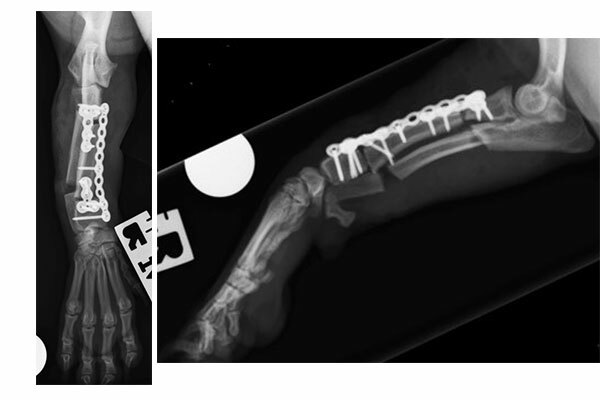 Above: buckling (forwards collapse of the wrist due to the severity of the deformities usually recognised during the load phase of the walk) demonstrated by an eight month old Jack Russell terrier with antebrachial deformity. Computed tomography (CT) is a useful way to assess the deformities because they are so severe. The typical appearance of CT scans of such a dog is shown below. Above: three-dimensional reconstruction of the forelimb of a terrier with antebrachial deformity used to measure the severity and location of the deformities for use during planning of surgical correction. Three dimensional models can be made from the CT scans and these can be used to aid planning of corrective surgery and to practice the surgery before performing it on the patient. The appearance of the most recent 3d model is shown below. Above: model created by 3-d printing comprising the bottom of the humerus, entire radius and ulna, carpus and part of the four metacarpal bones. Surgery often involves cutting of the bone (osteotomy) at multiple sites, realignment at the level of the osteotomies and then fixing the bone in its new position using plates and screws. The appearance of some xrays before and after corrective surgery are shown below. 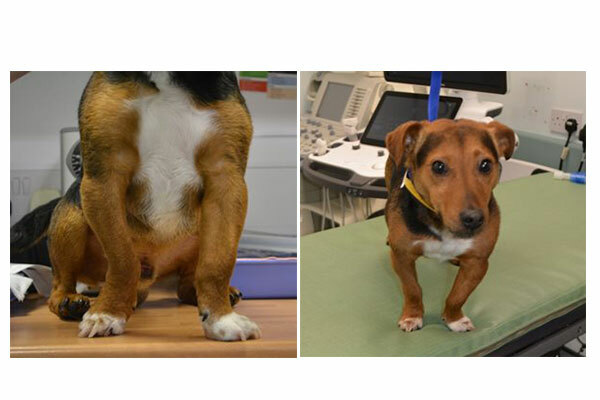 The photographs of a dog that underwent corrective surgery for right-sided deformity are shown below. Above: xray images of the right antebrachium after straightening. The osteotomies of the ulna are left ‘dynamic’ while the osteotomies of the radius are stabilised by application of plates and screws. All osteotomies heal over the course of two to three months. Above: photographs of the dog in the images of xrays shown above (left is pre-operative and right is post-operative). Note the change in the alignment of the right forelimb in the images.